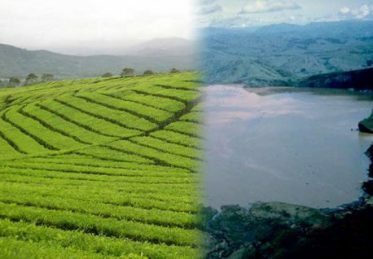 – the major dry season lasts from November to March and is followed by a minor rainy season from March to June, a minor dry season from June to August, and a major rainy season from August to November. A ”Cameroonian” climate exists in the West and the Adamaoua Regions. In these mountainous regions, there are two alternate seasons: A short, dry season from November to the end of February and an eight (8) month rainy season. The temperature in this region remains practically constant. The volcanic soils of this region make it a zone rich in agriculture.The northern part of the country enjoys a tropical climate, with a dry season from October to May and a rainy season from June to September. Garoua, in the center of the region, enjoys an average temperature of 12 in December and 44 in April. This is a touristic region par excellence.Yaoundé is the political capital with about one million inhabitants whereas Douala, the economic capital has a population of more than 02 million. The other main towns are Garoua, Bafoussam, Ngaoundéré, Maroua, Bamenda, Limbe, etc.Dry and rainy seasons alternate, with the dry season generally prevailing from November to April.Temperatures range from 23 to 31°C in January to 21 to 35°C in July.